Give me Jabber or give me the sweet release of death. Ironically, NOT seeing the Jabber is driving people insane. CA listens. They've shown that they can put in stuff the community wants in the past. People wanted Krell, they wanted fuller rosters and didn't give much a damn about new campaign maps, they wanted forging system for Dwarfs and Ungrim at Karak Kadrin. Where the community is consistent and unanimous in their desire for something, CA tends to attend to it, sooner or later. Granted, they've never done something on the scale of a Ghorgon or Jabber out of the blue, unless you count Bone Giant/Kharibdyss, but I think given the opportunity (WH3 development time) and funding, they will do so. 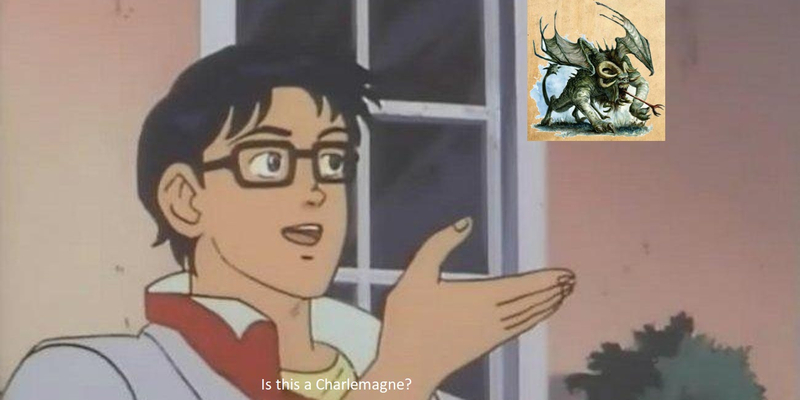 Especially Ghorgon. I hope they never release it, so we can continue with an endless stream of bad memes. No, that's half a Charlemagne. The memes will continue until morale improves! It will come when it comes. S'all good. Good effort but you're not quite there. I would say "It'll come when it does, s'all good". CRUSH THE WEAK (Jabberslythe and Ghorgons)! Unleash the Todrbinger! I can understand wanting the Ghorgon. I can't understand wanting the Jabberslythe. It didn't do anything on TT. 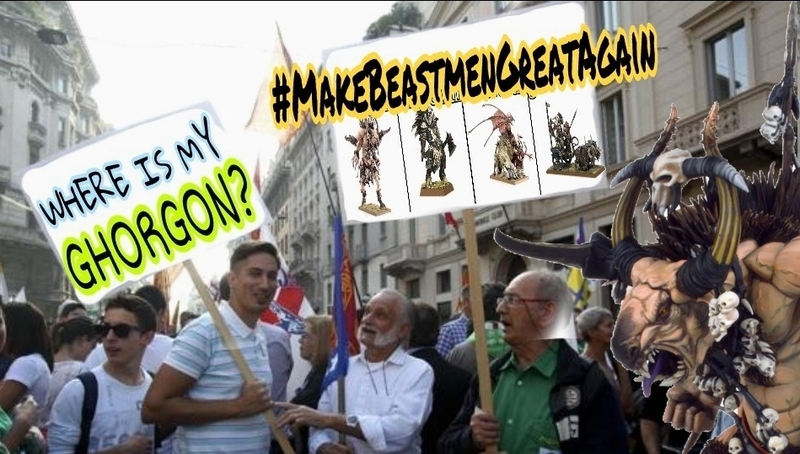 Besides, we need the Merwyrm first anyway, since it can go to Vampire Coast, Dark Elves and High Elves. Simply put it's overall design is a lot more interesting than the Ghorgon. The Ghorgon is just a crazed 4 armed giant Minotaur. The design is interesting though very complex, but the rules are difficult to translate from TT into Total War Warhammer, while the Ghorgon is a nice variant over the Cygor for choice. 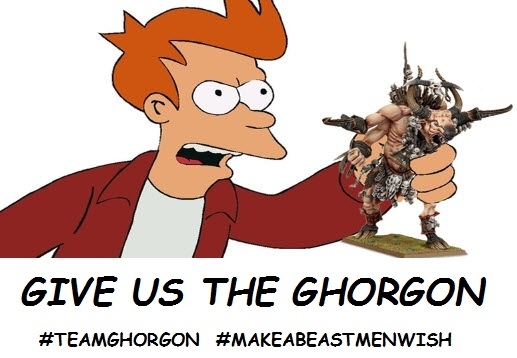 Yeah, so what's not to love about hte Ghorgon? The most glaring thing I see is that it's not the Jabber. Turns out none of them add anything of value to the roster anyway. Though if anything did it would be the Ghorgon. A Wargor with vanguard would add a lot more in my opinion. not really. Jabberslythe only had 2 rules that stood out. the ability to turn people insane and wounding anyone that attacked it. The second rule can be easily implemented. The first one can get the same treatment as Morghur got. As Morghur is suppose to turn any friendly or enemy unit into chaos spawn that got close. I'd say remove the buff stuff from the Gorebull (maybe aside of some Minor stuff for Minos), add the Wargor as Hero. Add Doombull as Lord with a Minotaur buff focused tree. The same could be said of the monsters for the Dark Elves. Majority of the large monsters in game aren't very viable. They are just for fun and fanservice. A large flying unit that gives BM the ability to have a snowball's chance in hell at contesting the air would be highly valuable. And a unit that can heal itself while fighting would be nice. Jabberslythe and Ghorgon fill those roles. This is basically what I'd want. After this? Then sure, add the big fluffy monsters. I agree. The Hydra is actually useful, I'll say, but the Kharybdiss was just a nice addition that I don't think I'm likely to use. Though, on the other hand, the Dark Elves have a pretty decent roster as it stands, so there is nothing that really screams out that they need it to be fun to play. Stuff like the Khary or the Bloodwrack Medusa would be neat additions, but they're not "needed" per se. If you can control it. The Cygor was, honestly, a much better choice for the Beastman than the Ghorgon or Jabber would have been. Look at its utility. It manages to be hard to silence and put pressure on the opponent, forcing them to do something (like walk into a trap, for instance). It gives the Beastmen long range arty that is incredibly annoying. The Ghorgon would be to the Giant what the Troglodon is to the Carnosaur. Useful and neat, but I don't know if it adds a ton of stuff to the roster really. The Jabber, thinking about it again, may indeed be better as an addition than the Ghorgon and so I was wrong. Just having a flying unit like that could change up the game. Though, again, it should be difficult to control so it would probably get Rampage. It would also, by the look of it, be mostly about killing infantry and so might not be so great at actually contesting the air. I don't think that it matches the Cygor in utility though. @Canuovea if we start thinking about "which unit is useful/innovative and which unit is useless for the gameplay". . . then we will never have complete rosters. And this is bad. The most useful stuff should come first. And "complete" rosters aren't all that important in my mind. I'd rather everyone have what they need to fit their flavour and be interesting first. Jabberslythe would have to have a weird mortis engine effect, and it would be anti armor. Depending on how CA interprets it, it would have a small AoE regular attack OR a breath attacks like dragons that were more powerful. Or both. On top of that it would have to have some way of reflecting its ability to cause enemies to hurt themselves. If you mix all that, yeah it would be geared towards infantry. But it would do an ok job at fighting other flying creatures. It could soften them up from a distance AND allow Ungors to have a clear shot in support of it. Ghorgons are glass cannon versions of Doombulls. And they could be given anti-large like all the "X -bull" units. Then you'd have a monster capable of taking on other monsters. Something Beastmen currently lack other than Gorbull. But the issue is Gorbull being a hero, who you have to send into deal with (usually) the more threatening opponents. If Gorbull gets killed or routs, your whole army suffers. And for BM that's a big issue.